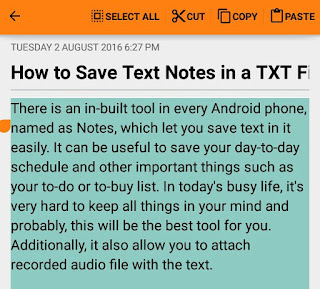 There is an in-built tool in every Android phone, named as Notes, which let you save text in it easily. It can be useful to save your day-to-day schedule and other important things such as your to-do or to-buy list. In today's busy life, it's very hard to keep all things in your mind and probably, this will be the best tool for you. Additionally, it also allow you to attach recorded audio file with the text. Well for me, as a blogger, it's very useful. Most of the tutorials published on this website, and even this one was first written on my phone's Notes app. You can save anything right from your Android phone anywhere and there is no need to use your laptop each time. One of the major drawback of using Android's default Notes app is that, it can't save text in a TXT file. All data will be saved in your phone's internal memory and you don't have access to move or copy that file directly. The main problem comes when you want to send the text saved in phone's Notes app to other people via internet or laptop, for example. In such cases, either you have to use other third-party notes apps or you have to create a TXT file manually, which can be shared easily. This is what we are going to discuss here. Getting started: 3 things you need! Text Editor app: First of all, you have to install a text editor app from Google Play Store. Most of the Android phones comes up with built-in editor app. I am using OfficeSuite free version. A Blank TXT File: Secondly, you should have a blank TXT file saved in your phone's internal memory or SD card. You can create one with Windows Notepad. File Manager app: Make sure that you've file manager app installed in your phone. Again, most of the Android phones have built-in file manager. I am using File Commander. Alternatively, you can install ES Explorer or Astro app. First of all, go to the Notes app. 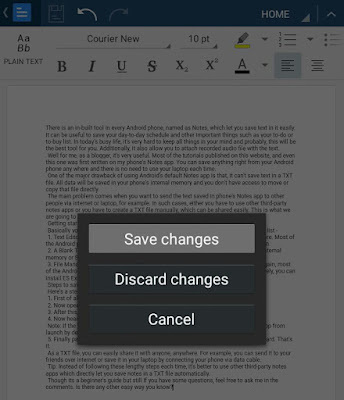 Now open the note you want to save and select all text in it. After this, copy the text to clipboard. 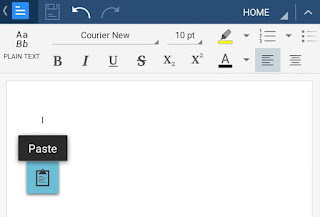 Now head over to the File Manager and open the blank TXT file in editor app. Note: If the file is opening in different app (other than editor), then either remove that app from launch by default action and try again or directly open the TXT file from editor. Finally paste all text inside it and save the edited file in your internal memory or SD card. That's it. As a TXT file, you can easily share it with anyone, anywhere. For example, you can send it to your friends over internet or save it in your laptop by connecting your phone via data cable. 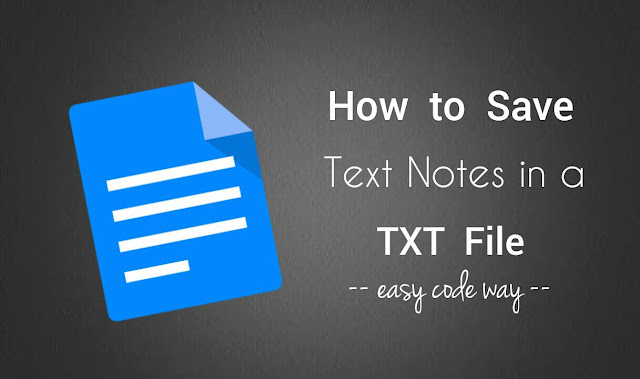 Tip: Instead of following these lengthy steps each time, it's better to use other third-party notes apps which directly let you save notes in a TXT file automatically. Though it's a beginner's guide but still If you have some questions, feel free to ask me in the comments. Is there any other easy way you know?